It’s a celebration of summer this week with Midsummer’s Day on Thursday and the Summer Solstice today. Midsummer’s Day is primarily a Celtic fire festival, which represented the middle of summer. 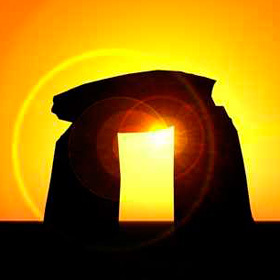 It dates back several millennia, and many stone circles (such as Stone Henge) are aligned to the sunrise on this day. Midsummer fires would be lit all over the countryside, and it was customary for people to jump through the fires, folklore suggesting that the height reached by the most athletic jumper would be the height of that year’s harvest. After Christianity was adopted in Britain, the festival became known as St John’s Day; the birthday of St John the Baptist. Traditionally St John’s Eve was seen as a time when fairies were thought to be at their most powerful (hence Shakespeare’s Midsummer Night’s Dream). Back to reality and modern life, I don’t think too many of us will be jumping fires on Thursday, but we can enjoy today’s Summer Solstice. And what a glorious day for it! The sun is shining, and hedgerows and gardens bursting with flowers. Why not make the most of the extra daylight and make the Foliage Fountain – it’s an elegant hanging basket and it only takes an hour. And for such minimal effort, what a result! The vivid colours will brighten up any porch or doorway. 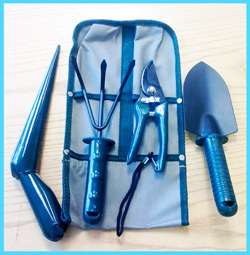 Each portable set contains a handy pouch with a fork, trowel, dipper and secateurs. It takes just a few seconds to enter online – so why not do it now? Good luck. Project taken from Seasonal Garden Ideas now available from the Dairy Diary store.